A new Lego Ideas set will bring the "Doctor Who" world to the small scale, including at least two of the Doctors, two Daleks, at least one companion, a weeping angel and the sonic screwdriver. "Doctor Who" fans know that size doesn't really matter — after all, the time machine used in that show is bigger inside than it is on the outside. 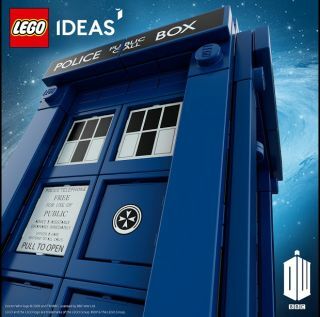 So it shouldn't be any problem for fans to imagine time-travel adventures using a Lego TARDIS (Time And Relative Dimension In Space). The Lego group will release this "Doctor Who" set at some point in December. The "Doctor Who" LEGO set appears to include at least two of the Doctors, two Daleks (enemies of the Doctor), at least one of the companions who travels with the Doctor, a weeping angel and the sonic screwdriver (a multifunctional tool the Doctor uses to solve problems in all sorts of situations). The company did not release a retail price for the set or availability details. The ninth series of the current iteration of "Doctor Who" began last month. "Doctor Who" has been running for most of the past 50 years; one of its distinguishing features is that every time the lead actor is ready to relinquish the role, the Doctor in the show dies and is resurrected as a new Doctor, who is played by the new lead actor.